JLS Designs offers a range of systems for etching, deposition, sputtering and coating processing. These systems can be customised to suit customers requirements and samples. We manufacture our systems to the highest standards using well proven materials and equipment. We work closely with customers from system concept and design to process development and technical support. 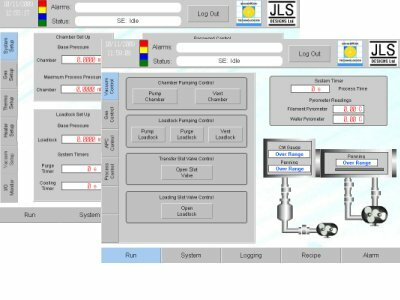 Each system is controlled by one of our PLC packages, these PLCs provide the system with a robust and reliable control system. The user front end has been developed to provide an intuitive and easy to use interface. The control system also provides full manual and auto controls, data logging, recipe and sequence handling. The system can also have ethernet capability for remote assistance from us at JLS Designs. Use the menu bar on the left to browse the current systems we offer, or contact us with any enquiries for specific tools. Copyright © 2010 JLS Designs Ltd. All rights reserved.